Photo, from left to right: Katie Grauer of Vermont Community Foundation, Kylie Webster of Vermont Federal Credit Union, Nicole Whalen of Vermont Foodbank, Todd Taylor of City Market and Corey Grenier of Seven Days. 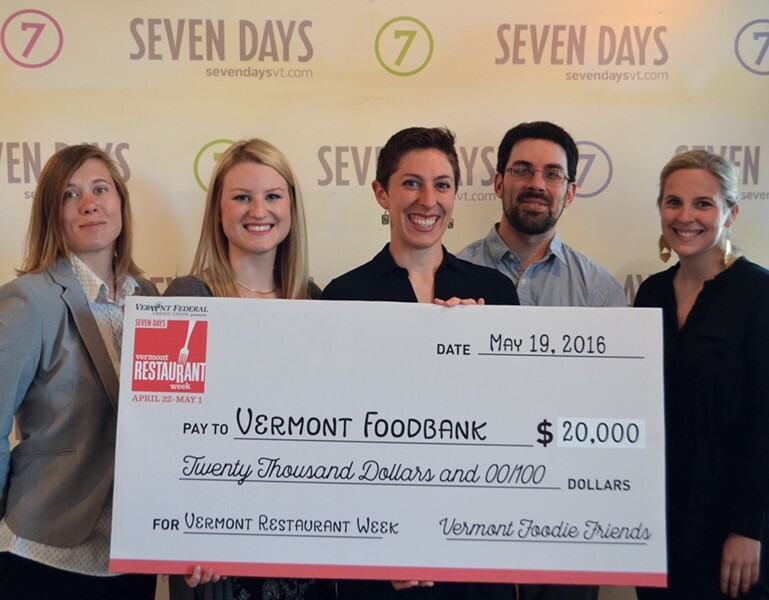 A total of $20,000 was donated to the Vermont Foodbank as a result of Seven Days' 7th annual Vermont Restaurant Week. This popular event was presented by the Vermont Federal Credit Union and organized by Seven Days, publisher of 7 Nights, the statewide guide to Vermont’s restaurants and bars. Many factors contributed to the total donation. All proceeds from the Best Bite Bash, a tasting event and competition among local chefs, went to the foodbank. Donations also came from a panel discussion at ArtsRiot; from Belly Laughs, a food-themed improv show at Vermont Comedy Club; event raffles; and a portion of sponsorship dollars. 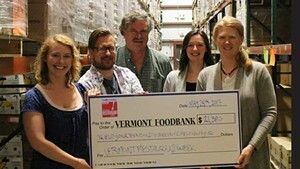 For the third year in a row, the Vermont Community Foundation provided a matching grant of $5,000 for the foodbank. The foundation was established in 1986 by Vermonters to serve their charitable goals and provides leadership in giving by responding to community needs, mobilizing and connecting philanthropists, and by keeping Vermont’s nonprofit sector vital with grants and other investments. City Market/Onion River Co-op, one of the festival’s sponsors, made the Vermont Foodbank its 40 percent recipient in the store’s Rally for Change program during the month of April. That program encourages customers to round up their total at the register. Lastly, participating restaurants were encouraged to set up individual fundraising pages on crowdrise.com to help raise more money for the foodbank. The Essex, Vermont’s Culinary Resort and Spa accumulated the most donations during the week. More than 100 restaurants across the state participated in Vermont Restaurant Week this year. Each location offered special, prix-fixe meals during the event, which ran from April 22 to May 1. In addition to Vermont Federal Credit Union, this year’s sponsors were Vermont Creamery, Switchback Brewing Co., WhistlePig Whiskey, Citizen Cider, City Market and the Vermont Department of Tourism & Marketing, with media support from Jumponit and WNCS the Point. Da Capo Publishing Inc., dba Seven Days, was founded by Pamela Polston and Paula Routly in 1995. In addition to its six free publications, the company also produces two annual events: Vermont Restaurant Week and the Vermont Tech Jam, a job fair and tech expo. In 2000, the Lake Champlain Regional Chamber of Commerce selected then-5-year-old Seven Days as Business of the Year. Eight years later, the Burlington Business Association did the same, citing the company's exemplary business practices, contributions to the community, and promotion of a positive image for Burlington, as well as business success. In 2015, Polston and Routly were inducted into the New England Newspaper Hall of Fame.